With my Pilsner still lagering it’s third week away (after a week-point-five fermentation), I finally started on the new brewstand! The design is a pretty standard 3-tier setup even though I have a pump. I’m not a welder (a quarter of welding in college isn’t enough), but want a metal stand so I will bolt together angle iron. While doing my research, I came upon the idea of using discarded bed frames instead. They are made out of the same stuff and I can easily find them for free. After a few weeks of trolling Craig’s List, I had enough to start. Yesterday, using a chop-saw, hacksaw and power drill, I cut four 42-inch legs for the tower that will hold the kettle and HLT. It’s a slow process because the frames are pretty hard. 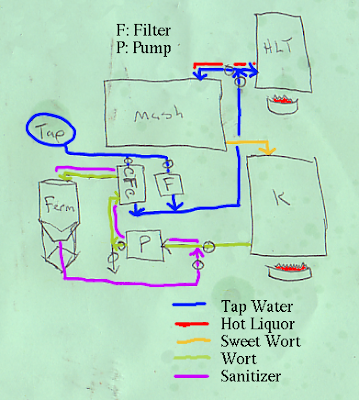 With five weeks work and a little luck, my stand should be done at the same time my pilsner is coming out of lagering. 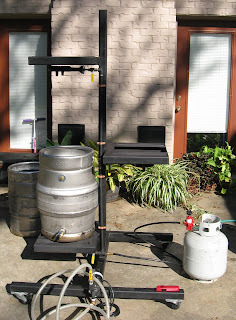 Really looking forward to kicking one back and brewing a batch on the new brewstand.